Mauricia Geissler is the chief investment officer at Amherst College, where she oversees all aspects of the endowment assets of the college and the Folger Shakespeare Memorial Library in Washington, DC. In this interview, she discusses adjusting the portfolio to a broader asset allocation structure and model; why she prefers working with high-conviction, active managers; and why she would not let a 'robo-advisor' manage her personal investments, let alone the assets for Amherst College. Mauricia Geissler was named on Trusted Insight's 2018 Top 30 Endowment Chief Investment Officers. She graciously spoke with us on February 23, 2018. The following interview has been edited and condensed. Trusted Insight: You’ve been with Amherst College since 2003. What did the portfolio you inherited look like then and how has it evolved over the course of your time there? Mauricia Geissler: When I arrived, the portfolio was already fairly diverse, but it still had some gaps. As an example, it had very little exposure to emerging economies. We were also fairly light in the natural resources. From an overall strategy standpoint, the shift for us was moving away from a highly compartmentalized asset allocation mindset to a much broader process around asset allocation. We moved away from that highly compartmentalized asset allocation to a much broader asset allocation structure that included allocations to global equities, real assets, fixed income and diversifying strategies. Within that diversifying strategy bucket, you might have distressed debt, market neutral or an absolute return manager who could go anywhere, do anything - publics, privates, U.S., non-U.S. and emerging. Additionally, there were very broad mandates in those four broad categories. "One of the things we like about the managers that we work with is that they tend to be active, highly concentrated, 'put your money where your mouth is' type of managers – high in the ‘Active Share’ category." When we think of the global equity bucket, it includes both public and private strategies, long-only and long-short strategies, as well as venture capital. We have a strategic target for global equity or equity-like risk. We include our long-short equity directional managers in that segment, so the long-short equity managers compete for capital against the long-only managers and against private equity capital. We have slightly different risk-return hurdles for each of those sub-segments, but we think about them as a quasi-homogeneous group. That has given us more freedom and flexibility to commit to investment partners that we think can add significant value to the portfolio and not get held up or tripped up by saying, "Oh, we don't have any small growth equity or momentum players in the U.S. equity bucket." As an endowment, we're focused on long-term capital preservation and growth. We’re not concerned if our small-cap portfolio performed better than the small-cap benchmark. That benchmark can be down 20 percent, and if we're down 15, that's not going to meet the overall objectives that we're trying to accomplish. Moving to a broader asset allocation structure/model is probably one of the most significant shifts over the last 15 years. The other shift is in our mindset and focus on making sure we are allocating capital to our highest conviction managers and eliminating marginal portfolios. One of the things we like about the managers that we work with is that they tend to be active, highly concentrated, 'put your money where your mouth is' type of managers – high in the ‘Active Share’ category. When I joined the college, we had an excess of 100 managers. That was a lot of managers for a portfolio that was under $1 billion, and clearly had a fair amount of redundancy. We're at $3 billion AUM today, and we work with 63 sustaining managers across the entire portfolio. We looked in the mirror and said, "Are we executing in the same way we're asking our managers to execute?" If we have high-conviction managers, are we allocating enough capital to them to have a material impact on results? If they're not of high-conviction, and we don't see them as long-term sustaining relationships, why do we have them in the portfolio? We've concentrated the number of investment partners we work with very consciously, and that's been a very long process, in part because there were gaps in the portfolio were we needed to add managers. So we have been very diligent and methodic in continuing to try to focus the portfolio with a smaller and smaller group of high-conviction managers. We have some 20-year relationships, and they're meaningful relationships in our overall structure, both public and private. Trusted Insight: Amherst trimmed down from 73 managers to 63 since 2016. Are you looking to continue reducing that number? Mauricia Geissler: We're down a little more, which is great. Can we get lower? I’m not sure. I think it's always good to have a little space for newer relationships that you start small and try and grow. There will always be managers that are driven primarily by one individual, and as they near retirement, there's no clear succession plan in place and you will ultimately need to replace from them in the portfolio. The total pool that we oversee, which is managed as one pool, is roughly three billion today. You think of 100 plus managers for under $1 billion versus 63 for a $3 billion-dollar pool. There are some meaningful relationships there. We build these relationships over many years, and the longer the relationship, the more familiar and the more knowledge you have about that investment partner. Along the way, you're hopefully building more and more conviction. The more conviction, the more comfortable you are understanding the risk within that portfolio and being willing to commit significant assets. Trusted Insight: In your last interview, you mentioned that you were seeking investment opportunities in places like sub-Saharan Africa. Are you still pursuing opportunities in that area or are you looking elsewhere? Mauricia Geissler: Yes, we were exploring sub-Sahara Africa, Latin America and other regions. However, we didn’t actually do anything. We still have a significant bias to Asia and are still keen on the growth opportunities in both China and, to a lesser extent, in India. "We're all unique institutions, and while we think about what our peers are doing, and we clearly share information with many of them, at the end of the day, our focus is on managing and satisfying the needs of Amherst College​." The Asian region, in particular, continues to be of interest to us, and we are taking advantage of opportunities across the board whether it's public equities, private equities or venture. We've looked at distress debt opportunities, which is shocking to say, but we haven't executed anything in that particular space, though we're still very keen on Asia. We are broadly global, more so than many other plans. A big chunk of our managers have global mandates or unrestricted mandates to take the portfolio to where the opportunities are, and that has served us quite well. Trusted Insight: Monetary and regulatory policies have created ultra low-interest rates; high valuations; and crowded public and private markets. Do you recognize the markets as they are today? Mauricia Geissler: Yes, and we definitely worry about the low-interest rate environment and believe rates will go up. We worry about inflation. We worry about excess capital sloshing around and the number of new managers who are getting funded with no track record, funds that have grown 3x from the last fund that was raised, and how are they going to put that money to work and earn the same types of return? You adjust on the margin, but I think being focused on trying to do a lot of nothing and stick with what you know and the people you know is a good policy to have in this environment. That doesn't mean that in the short term they might not get caught in the market volatility, but over the long term, they stay disciplined and focused. Being reactionary will act appropriately to not lock in significant losses and recover as the markets recover. Trusted Insight: Does the increasing number of sophisticated investment offices present a challenge in standing out from the crowd? Mauricia Geissler: I think the most important thing any endowment office can do is focus on the needs and the specific risk and return parameters for their institution. We're all unique institutions, and while we think about what our peers are doing, and we clearly share information with many of them, at the end of the day, our focus is on managing and satisfying the needs of Amherst College. When you think too much about what your peers are doing or why they're doing it, you start losing sight of the path that will allow you to achieve success for your specific institution and what has gotten you to where you are. Yes, it's competitive. The markets have always been competitive in different ways. There are always new products and strategies being developed. I'd like to think that we really try to understand what something is before we dive deeply into it. If we can't understand it, it's probably best just to stand on the sidelines and see what happens with other people’s money. If at some point a new product or a new strategy makes sense for Amherst College, then we'd pursue it. I think that as markets continue to evolve and change, some strategies become less interesting in the current environment. Being aware of that is important. Trusted Insight: Do you believe machine learning and artificial intelligence will have an impact on institutional investing? Mauricia Geissler: I definitely think it will have an impact. The first and foremost impact we are already seeing is the ability of managers to systematically and quickly analyze vast volumes of data. However, I still believe that judgment plays a crucial role in investing and understanding when the data could give you false positives or false negatives. I also believe that machine learning and big data analysis is playing a role in making analysis more efficient and effective. In fact, AI and machine learning have a role to play in many industries. Are your managers taking advantage of that? Whether it's in the health care space, manufacturing or other industries, how are they taking advantage of these new technologies? Maybe I'm too old, but I'm not sure I would ever rely on a robo-advisor for personal investment advice, let alone managing the assets for Amherst College. I'd much rather have committee members who have been through multiple market cycles and have decades-long of experience in these markets to say, "Okay, what do we think is different? And what's not so different?" Having that human judgment is an important part of the process. I'm more biased towards their great tools to have and to utilize. In five to ten years from now, managers who aren't utilizing or upgraded to those tools will fall significantly behind. But I'm still not convinced that they will replace institutional managers. If you ask perhaps a younger investor, they’d probably have a completely different perspective. 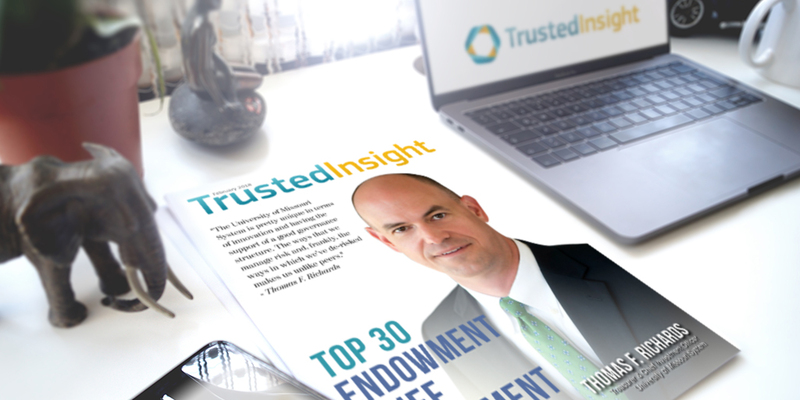 Trusted Insight: Is there anything that you'd like to add about Amherst or endowment investing broadly? Mauricia Geissler: One of the underrated or under-appreciated values that exist in many endowments, foundations and family offices is continuity and longevity of the investment teams and the committees with which they work. In addition to that, the perpetual nature of the pool of assets that they manage, allowing them to have a long-term focus on managing that asset pool. There clearly has been a turn over in the endowment and foundation world, but where you find longevity and continuity of leadership in teams, you tend to find better performance. I think there's definitely a correlation there. You can view our full catalog of interviews with institutional investors here. Click here to view the complete list of 2018 Top 30 Endowment Chief Investment Officers.